Political advertisements can get mean, but two new TV spots in the race for Mark Begich’s U.S. Senate seat are trying for that warm, fuzzy feeling. Former secretary of state Condoleeza Rice stars in an ad for Republican challenger Dan Sullivan. The ad aims to quash the argument of a pro-Begich super PAC that Sullivan belongs more to the Beltway than to Alaska. The ad describes Sullivan as a “tireless” defender of the country. “Now Dan faces political attacks because he wanted his family by his side. Remember that serving our country required some time in our Capital,” Rice says in the ad. 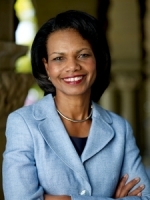 Sullivan was an assistant secretary of state under Rice from 2006 to 2009. The ad is from Republican Super Pac American Crossroads, which spent $180,000 to air it. Crossroads says the ad is its first in a Senate primary, and Rice’s first endorsement of any Senate candidate. Rice is due to headline a big GOP fundraiser for House Republicans this week. Meanwhile, the Begich campaign is airing an ad showing footage of both the senator and of his Congressman father, campaigning across Alaska by small airplane, four decades apart. The race is said to be tightening. National data whiz Nate Silver says the incumbent has lost some ground, but he still favors Begich to win. A poll released yesterday by New Jersey-based Rasmussen Reports puts Republican Mead Treadwell ahead in a match-up with Begich, but within the margin of error. In a Sullivan-Begich contest, the polling firm says voters are evenly split.